compromise policy solution in a situation of political stalemate. The coalition sidelined not only environmental groups that favored taxation and command-and-control regulation but also business interests that rejected any emission controls. Considering the sources of business influence, Meckling emphasizes the importance of political opportunities (policy crises and norms), coalition resources (funding and legitimacy,) and political strategy (mobilizing state allies and multilevel advocacy).Meckling presents three case studies that represent milestones in the rise of carbon trading: the internationalization of emissions trading in the Kyoto Protocol (1989--2000); the creation of the EU Emission Trading System (1998--2008); and the reemergence of emissions trading on the U.S. policy agenda (2001--2009). 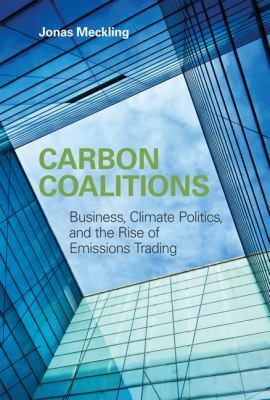 These cases and the theoretical framework that Meckling develops for understanding the influence of transnational business coalitions offer critical insights into the role of business in the emergence of market-based global environmental governance. Jonas Meckling is a Postdoctoral Fellow at the Belfer Center for Science and InternationalAffairs, Harvard University.